Bringing out the personality in your little person’s party. 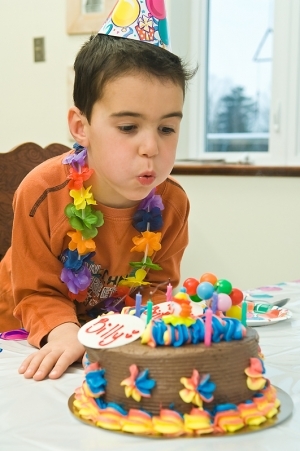 Is your head spinning from the multitude of decisions surrounding your child’s birthday party? Or, are you completely fresh out of ideas? In either case, you likely wish that planning a personalized party incorporating your child’s interests and preferences could be as easy as waving a magic wand. Pulling off a memorable event is not as simple as saying “hocus pocus.” However, by dreaming up a few special touches in your downtime, you can create the illusion of a carefully crafted occasion celebrating your child. As the mother of 9-year-old triplets, Emma, Brett and Joshua, I have attended countless parties. The party locations have ranged from tumbling gyms and bowling alleys, to arts and crafts centers and laser tag arenas— and everything in between. Approach finding your ideal location like you would a jigsaw puzzle, by tackling one piece at a time. A great starting point is to hone in on your child’s favorite hobby and consider parties your child has attended that have appealed to his or her personality. From there, consider the different venues available by doing online searches, asking for recommendations, looking around in person and ultimately finding the best fit. Once you’ve chosen the location, the other pieces should easily fall into place with a bit of imagination and an eye for detail. As the mother of triplets, I go to great lengths to choose a theme or motif based on each one of my children’s individual preferences at their parties. I focus on the small ways that add up to make big differences. This is where color comes into play. You can do something as simple as specifying your child’s color preference. When all of the balloons are inflated in your child’s favorite color, they emphasize your child’s style. This trick has come in handy at my children’s parties, with Emma’s friends flocking to the purple tables, Brett’s gravitating toward the yellow tables and Joshua’s frequenting the orange tables. Surely you could embellish with your child’s favorite character and carry out the theme, as well. It’s usually easy to determine your child’s most desired character depending on the most requested toys and videos, and the songs playing in your, I mean your child’s, head. Regarding invitations, the place holding the party may provide them. Whether using a venue’s invites, preprinted invitations or invitations you fill out, you can decorate envelopes with stickers paying homage to the party’s color scheme, theme or main activity. Keep in mind that putting stickers on envelopes or merely wrapping envelopes around slender invitations saves many invites from getting lost among stacks of unsolicited mail. Depending on how much time you have at a party location, you might bring an item, such as a T-shirt, theme-related object or book, for friends to sign. Reminiscent of a sign-in board, something to autograph gives elementary-aged children a fun side activity during parties while providing a festive keepsake for the birthday star. Enhance the sign-in activity with precious or hysterical photos to display either on or alongside the sign-in object for the ultimate personal touch. Everyone enjoys seeing a good spaghetti-on-the-head shot! This helps distinguish one faceless event from the next with added entertainment value. When it comes to cake (one of my favorite subjects), each of my triplets receives his or her own celebratory confection and round of “Happy Birthday.” The cakes are adorned with different decorations and colored candles. Every cake also offers a traditional place to highlight the birthday child’s favorite hobby, character or interest. Have your camera handy when the cake makes its debut. A group photo of party attendees surrounding the birthday child makes a fabulous addition to thank-you notes sent out for the various gifts. Leave a lasting impression at your child’s birthday by giving a suitable party favor or goody bag. With the prevalence of food allergies, I prefer to emphasize non-food items. More precisely, I prefer one carefully chosen item to give to all guests. I know the dentists will cheer me on when I say we have more taffy, lollipops and sticky gummies than my kids should ever eat. We also have owned more broken plastic unknowns that have pushed the outer limits of my sanity. Please control the urge to stuff a half dozen things into a bag in favor of one sturdy favor, such as a journal, a bubble set, a chef’s apron or sidewalk chalk. A personalized recyclable water bottle sporting the party theme or merely distributed at an athletic party would be a hit for many families— even if a lollipop is thrown in for good fun. One of my family’s most memorable parties had a magic theme, complete with rabbit-in-the-hat invitations, a magician as an entertainer and a magic trick favor that included one substantial chocolate bar, which was not made in a facility with nuts. During the party, I filled magic hats with popcorn, pretzels and potato chips to serve as appetizers. Purple, yellow and orange balloons adorned the tables. And, of course, there were three separate cakes. When planning your child’s next bash, you can have your cake and eat it, too. In my case, there is plenty of cake to go around!